مسعودی پور, ندا, صادقی, مهربان, بهپور, محسن, محمدی مقدم, فاضل, سدهی, مرتضی. (1395). کارایی نانوذرات فوتوکاتالیست تثبیت شده بر روی میکروگلوله‌های شیشه‌ای در حذف سیانید با نور خورشید. مجله آب و فاضلاب, 27(6), 42-49. ندا مسعودی پور; مهربان صادقی; محسن بهپور; فاضل محمدی مقدم; مرتضی سدهی. "کارایی نانوذرات فوتوکاتالیست تثبیت شده بر روی میکروگلوله‌های شیشه‌ای در حذف سیانید با نور خورشید". مجله آب و فاضلاب, 27, 6, 1395, 42-49. مسعودی پور, ندا, صادقی, مهربان, بهپور, محسن, محمدی مقدم, فاضل, سدهی, مرتضی. (1395). 'کارایی نانوذرات فوتوکاتالیست تثبیت شده بر روی میکروگلوله‌های شیشه‌ای در حذف سیانید با نور خورشید', مجله آب و فاضلاب, 27(6), pp. 42-49. مسعودی پور, ندا, صادقی, مهربان, بهپور, محسن, محمدی مقدم, فاضل, سدهی, مرتضی. کارایی نانوذرات فوتوکاتالیست تثبیت شده بر روی میکروگلوله‌های شیشه‌ای در حذف سیانید با نور خورشید. مجله آب و فاضلاب, 1395; 27(6): 42-49. در این مقاله، تخریب نوری سیانید با استفاده از فوتوکاتالیست S, N-TiO2 سنتزی به‌وسیله روش سل- ژل تثبیت شده بر روی میکروگلوله‌های شیشه‌ای مورد بررسی قرار گرفت. تیواوره به‌عنوان منبع نیتروژن و گوگرد و تترابوتیل اورتوتیتانات از ترکیبات اصلی سنتز فوتوکاتالیست بودند. 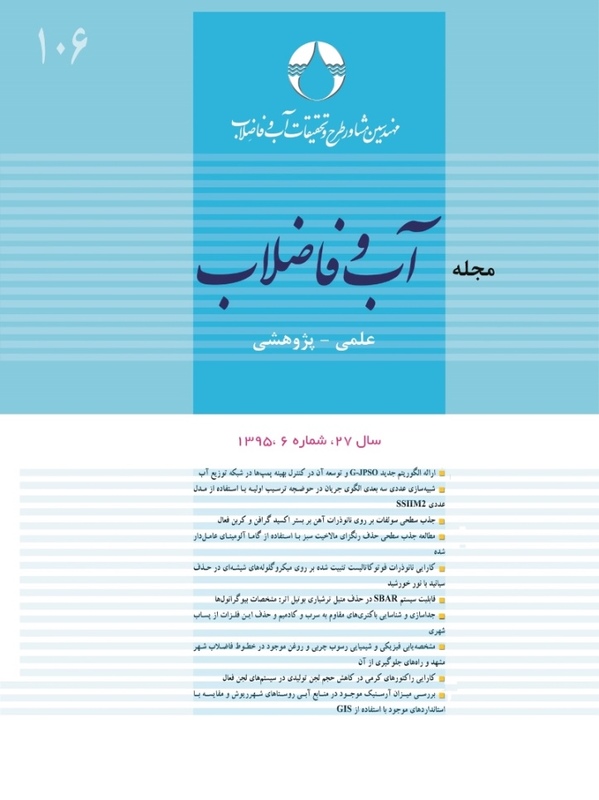 اثر مقدار تیواوره، نور مرئی (لامپ 400 وات) و خورشید، زمان تابش و مقدار متفاوت اولیه سیانید (50، 100، 200 و ppm 300) روی تخریب نوری سیانید مطالعه شد. به‌منظور اندازه‌گیری غلظت سیانید از روش تیتراسیون استفاده شد. خصوصیات فیلم فوتوکاتالیست سنتزی به‌وسیله پراش پرتوی ایکس، اسپکتروسکوپی مرئی- فرابنفش انعکاسی، میکروسکوپ الکترونی روبشی و طیف‌سنجی پراش انرژی پرتو ایکس تعیین شد. الگوی XRD و تصاویر SEM، اندازه نانومتری فوتوکاتالیست سنتزی را تأیید کردند. آنالیز EDX و DRS نیز به‌ترتیب حضور S و N و فعالیت نوری فوتوکاتالیست در ناحیه مرئی را نشان دادند. سیانید با غلظت ppm50، در حضور فیلم S, N-TiO2 با 25 گرم تیواوره، بالای 94 درصد در نور مرئی و در حدود 100 درصد در نور خورشید، در مدت زمان 4 ساعت تخریب شد. فوتوکاتالیست S, N-TiO2 تثبیت شده بر روی میکروگلوله‌های شیشه‌ای می‌توانند به‌صورت مؤثری به‌عنوان یک روش جدید برای تصفیه پساب صنایع حاوی سیانید، تحت نور خورشید به‌کار رود. This paper investigates cyanide photodestruction (at pH 9) using the S, N-TiO2 photocatalyst synthesized by the sol-gel method and stabilized on glass microbeads. The main raw materials were thiourea, as a source of N and S, and tetra butyl ortho titanate. The effects of S and N doses, visible light (a 400W light), sunlight, irradiation time, and different initial cyanide concentrations (50, 100, 200, and 300 ppm) were studied on cyanide photodestruction. Cyanide concentration was measured by the titration method and the photocatalyst film was characterized by X-ray diffraction (XRD), UV-Vis diffuse reflection spectroscopy (DRS), Scanning Electron Microscopy (SEM), and Energy dispersive X-ray (EDX) analysis. XRD patterns and SEM images were used to determine the nanoparticle size of the photocatalyst on glass microbeads. EDX and DRS analyses confirmed the presence of S and N as well as the activity of the photocatalyst in the visible region, respectively. The S, N-TiO2 film with 0.25 g Thiuourea proved to be the best cyanide photodestruction agent in the visible light. Based on the results obtained, S, N-TiO2/ glass microbead was capable of destroying cyanide (50 ppm) by up to 94% in the visible light and by approximately 100% in the sunlight. The results also indicated that S, N-Tio2/scoria stone was capable of destroying cyanide by 85% in the visible light and by 94% in the sunlight within 4 h. The reaction kinetic for all cyanide concentrations and two photocatalyst substrates were described by a first order equation. Finally, it was concluded that the S, N-TiO2 stabilized on glass microbeads could be effectively used as a new method for treating wastewater containing free cyanide under the sunlight. 1. APHA, WEF. (2012). Standard methods for the examination of water and wastewater, APHA, AWWA, WEF, USA. 2. Augugliaro, V., Loddo, V., Marci, G., Palmisano, L., and Lopez-Munoz, M. J. (1997). “Photocatalytic oxidation of cyanides in aqueous titanium dioxide suspensions.” Journal of Catalysis, 166(2), 272-283. 3. Baeissa, E. S. (2014). “Photocatalytic removal of cyanide by cobalt metal doped on TiO2–SiO2 nanoparticles by photo-assisted deposition and impregnation methods.” Journal of Industrial and Engineering Chemistry, 20(5), 3761-3766. 4. Baeissa, E. S. (2015). “Synthesis and characterization of sulfur-titanium dioxide nanocomposites for photocatalytic oxidation of cyanide using visible light irradiation.” Chinese Journal of Catalysis, 36(5), 698-704. 5. Behpour, M., and Atouf, V. (2012). “Study of the photocatalytic activity of nanocrystalline S, N-codoped TiO2 thin ﬁlms and powders under visible and sun light irradiation.” Applied Surface Science, 258(17), 6595-6601. 6. Botz, M. M., Mudder, T. I., and Akcil, A. U. (2005). “Cyanide treatment: Physical, chemical and biological processes.” Advances in Gold Ore Processing, M. Adams, ed., Elsevier Ltd., Amesterdam, 672-702. 7. Bozzi, A., Guasaquillo, I., and Kiwi, J. (2004). “Accelerated removal of cyanides from industrial efﬂuents by supported TiO2 photo-catalysts.” Applied Catalysis B: Environmental, 51(3), 203-211. 8. Chiang, K., Amal, R., and Tran, T. (2002). “Photocatalytic degradation of cyanide using titanium dioxide modiﬁed with copper oxide.” Advances in Environmental Research, 6(4), 471-485. 9. Dai, X., and Breuer, P. L. (2009). “Cyanide and copper cyanide recovery by active carbon.” Minerals Engineering, 22(5), 469-476. 10. Dash, R. R., Gaur, A., and Balomajumder, C. (2009). “Cyanide in industrial wastewaters and its removal: A review on biotreatment.” Journal of Hazardous Materials, 163(1), 1-11. 11. Do, S.-H., Jo, Y.-H., Park, H.-D., and Kong, S.-H. (2012). “Synthesis of iron composites on nano-pore substrates: Identiﬁcation and its application to removal of cyanide.” Chemosphere, 89(11), 1450-1456. 12. Farrokhi, M., Yang, J.-K., Lee, S.-M., and Shirzad-Siboni, M. (2013). “Effect of organic matter on cyanide removal by illuminated titanium dioxide or zinc oxide nanoparticles.” Journal of Environmental Health Science and Engineering, 11 (1), 23-31. 13. Frank, S. N., and Bard, A. J. (1977). “Heterogeneous photocatalytic oxidation of cyanide ion in aqueous solutions at TiO2 powder.” Journal of the American Chemical Sociaty, 99(1), 303-304. 14. Fujishima, A., Zhang, X., and Tryk, D. A. (2008). “TiO2 photocatalysis and related surface phenomena.” Surface Science Reports, 63(12), 515-532. 15. Gurbuz, F., Ciftci, H., and Akcil, A. (2009). “Biodegradation of cyanide containing effluents by Scenedesmus obliquus.” Journal of Hazardous Materials, 162(1), 74-79. 16. Laera, G., Jin, B., Zhu, H., and Lopez, A. (2011). “Photocatalytic activity of TiO2 nanoﬁbers in simulated and real municipal efﬂuents.” Catalysis Today, 161(1), 147-152. 17. Latkovaska, B., and Figa, J. (2007). “Cyanide removal from industrial wastewater.” Polish Journal of Environmental Study, 16(2), 748-752. 18. Li, H., Wang, J., Li, H., Yin, S., and Sato, T. (2010). “Photocatalytic activity of (sulfur, nitrogen)-codoped mesoporous TiO2 thin films.” Research inChemical Intermediates, 36(1), 27-37. 19. Mascolo, G., Comparelli, R., Curri, M. L., Lovecchio, G., Lopez, A., and Agostiano, A. (2007). “Photocatalytic degradation of methyl red by TiO2: Comparison of the efficiency of immobilized nanoparticles versus conventional suspended catalyst.” Journal of Hazardous Material, 142(1-2), 130-137. 20. Miranda-Garcia, N., Suarez, S., Sanchez, B., Coronado, J. M., Malato, S., and Maldonado, M. J. (2011). “Photocatalytic degradation of emerging contaminants in municipal wastewater treatment plant effluents using immobilized TiO2 in a solar pilot plant.” Applied Catalysis B: Environmental, 103(3-4), 294-301. 21. Mohamed, R. M., and Mkhalid, I. A. (2010). “The effect of rare earth dopants on the structure, surface texture and photocatalytic properties of TiO2–SiO2 prepared by sol–gel method.” Journal of Alloys and Compounds, 501(1), 143-147. 22. Murgolo, S., Petronella, F., Ciannarella, R., Comparelli, R., Agostiano, A., Curri, M. L., and Mascolo, G. (2014). “UV and solar-based photocatalytic degradation of organic pollutants by nano-sized TiO2 grown on carbon nanotubes.” Catalysis Today, 240A, 114-124. 23. Pedraza-Avella, J. A., Acevedo-Pen, P., and Pedraza-Rosas, J. E. (2008). “Photocatalytic oxidation of cyanide on TiO2: An electrochemical approach.” Catalysis Today, 133-135, 611-618. 24. Prieto-Rodriguez, L., Miralles-Cuevas, S., Oller, J., Aguera, A., Puma, G. L., and Malato, S. (2012). “Treatment of emerging contaminants in wastewater treatment plants (WWTP) effluents by solar photocatalysis using low TiO2 concentrations.” Journal of Hazardous Material, 211-212, 131-137. 25. Qin, W., Qi, J., Chen, Y., Li, H., and Wu, X. (2013). “Visible light drived N, S -codoped TiO2 photocatalysts grown by microplasma oxidation method.” International Journal of Electrochemical Science, 8(6), 7680-7686. 26. Rauf, M. A., Meetani, M. A., and Hisaindee, S. (2011). “An overview on the photocatalytic degradation of azo dyes in the presence of TiO2 doped with selective transition metals.” Desalination, 276(1-3), 13-27. 27. Rengifo-Herrera, J. A., and Pulgarin, C. (2010). “Photocatalytic activity of N, S co-doped and N-doped commercial anatasa TiO2 powders towards phenol oxidation and E. coli inactivation under simulated solar light irradiation.” Solar Energy, 84(1), 37-43. 28. Sousa, M. A., Gonçalves, C., Vilar, V. J. P., Boaventura, R. A. R., and Alpendurada, M. F. (2012). “Suspended TiO2-assisted photocatalytic degradation of emerging contaminants in a municipal WWTP effluent using a solar pilot plant with CPCs.” Chemical Engineering Journal, 198-199, 301-309. 29. Sugihara, M. N., Moeller, D., Paul, T., and Strathmann, T. J. (2013). “TiO2-photocatalyzed transformation of the recalcitrant X-ray contrast agent diatrizoate.” Applied Catalysis B: Environmental, 129, 114-122. 30. Szpyrkowicz, L., Kaul, S. N., Molga, E., and DeFaveri, M. (2000). “Comparison of the performance of a reactor equpped with a Ti/Pt and an SS anode for simultaneous cyanide removal and copper recovery.” Electrochimica Acta, 46(2-3), 381-387. 31. Wang, D., Yu, B., Zhou, F., Wang, C., and Liu, W. (2009). “Synthesis and characterization of anatase TiO2 nanotubes and their use in dye-sensitized solar cells.” Materials Chemistry and Physics, 113, 602-606. 32. Wang, J., Li, H., Li, H., and Zou, C. (2010). “Mesoporous TiO2-xAy (A = N, S) as a visible-light-response photocatalyst.” Solid State Sciences, 12(4), 490-497. 33. Yeber, M. C., Soto, C., Riveros, R., Navarrete, J., and Vidal, G. (2009). “Optimization by factorial design of copper (II) and toxicity removal using a photocatalytic process with TiO2 asemiconductor.” Chemical Engineering Journal, 152(1), 14-19.